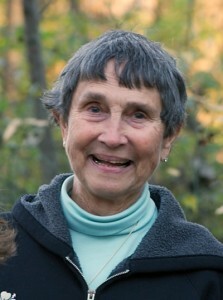 Sandra Pleasants is a Certified Iyengar Yoga Teacher in Central Virginia. Sandra discovered Iyengar yoga in her late 40’s. Her 5 children were then grown so she had time to devote to an intensive practice. She was inspired by her teacher Betsey Downing to become a teacher in her own right. She is now in her 80’s and continues to practice and teach. Her Life experience as mother of 5 and grandmother of 8 gives her and accessibility that allows students to feel simultaneously challenged and supported. Her down to earth teaching style is precise, dynamic and laced with humor. She has been to India 4 times to study at the Iyengar Institute with BKS Iyengar, his daughter, Geeta, and son, Prashant. In the course of her continuing studies with the Iyengars and his senior teachers, both in this country and abroad, she has obtained 5 levels of certification in his system. She is also certified as an E500 hour with the Yoga Alliance. The E is a special designation meaning the director of an authorized teacher training program. She also completed a 700 hour 2 year training program for teachers in various yoga disciplines through the Yoga Research and Education Center in California founded by Georg Feuerstein. For 12 years Sandra went annually to Florence Italy for intensive studies with Gabriella Giubilaro and has assisted her in Minsk Belarus for 5 of those years. She was apast president and treasurer of the Iyengar Association of the Southeast. She was the author of the asana column for the magazine the Southeast Iyengar Association for the year 2007. In 1991, Sandra taught a program for Nelson County for 2 years called “Growing Younger” aimed a bringing health education and exercise to seniors throughout the county. Beginning in 1982 she volunteered in Charlottesville for 10 years with the city sponsored Senior Nutrition Lunch program giving chair massages to the attendees. For another 7 years she volunteered in Nelson County with the Senior Nutrition Program offering weekly exercise for the seniors attending the program. She continues to teach 5classes a week both in Nelson County, where she lives, and also at Allied Yoga in Charlottesville. For six years she was the co-director, along with Jennifer Elliot, an Astanga teacher, of a 10 month, 200 hour training program for teachers for the Yoga Alliance at Yoga Source in Richmond. This is a unique program combining two lineages of hatha yoga. Several years ago for the University of Virginia she designed and taught an 8 week course for people over 60 to see if yoga could improve their ability to walk. She also designed and taught 3 different 10 week studies for the UVA Dept. of Physical Medicine and Rehabilitation to see if yoga can help people with Parkinson’s disease. Her students were delighted with the improvement the classes brought to their lives. She was also involved in a study for UVA Dept. of Complimentary and Alternative Medicine on the effects of Iyengar yoga on postmenopausal women at risk for diabetes and cardiovascular problems. This study showed the positive benefits of yoga on matabolic syndrome. Sandra continues to be inspired by the affects of yoga in her own life as well as that of her students.